Although it may seem insignificant, switching to a Gmail faxing service has a huge impact on saving our environment. As more businesses make the switch, the more we are helping to save tress and reduce carbon dioxide emissions, which is the #1 cause of global warming. Aside from providing an affordable and fast way to send and receive faxes, internet faxing also gives you a way to make your business greener. Jumping into the green bandwagon seems to be the latest trend but this trend actually provides a lot of benefits on both ends. More importantly it helps reduce waste and helps demonstrate that your business is ready for social change. Having a fax machine in the office means that it has to be plugged in all the time. Turning off the machine means you risk receiving an important fax. This is why Energy Star concluded that the fax machine is the most energy consuming office equipment, because it has to be plugged in all day. Carbon dioxide is created by an electrical connection. A single fax machine can consume around 321 kilowatt a year which anually emits almost 200 kg of CO2. Each year in the US fax machines emit 4,763,000,000 kg. According to the infographic above, it is estimated that there are around 46.3 million fax machines being used worldwide. Imagine if at least half of those users switched to online faxing… less CO2 emissions and a lot of trees would be saved. Did you know that a 15 year old tree makes just 1/2 a box of paper? 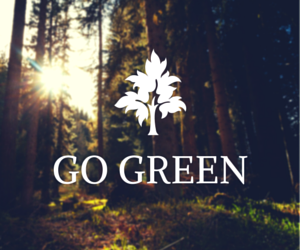 By switching to electronic faxing you can save a tree each year. Using the internet to transmit faxes means your business will also reduce the amount of paper it consumes because all documents can be received, sent and even edited through the computer. According to the Environmental Protection Agency (EPA), in the US we use around 69 million tons of paper each year. A rough estimate was calculated to show that if just 1% of paper faxes where done through online faxing each year it would save 73.5 million trees. In addition to using paper, fax machines also require constant ink cartridges. These cartridges become solid waste which then take 450 years to decompose in landfills. This is why email faxing is becoming increasingly popular as each year goes by. It provides benefits for the user and for the environment. Most importantly, it’s very easy to use and like most online services it doesn’t require complicated set ups because everything is managed through the internet. Having a virtual fax machine is also beneficial for business because you can view your fax machines where you go, compared to being tied down to the fax machine at the office. You can check out the benefits first-hand by trying an online fax service today at no cost, visit our homepage for more information.